Electron microscopy (EM) not only provides a straightforward approach to scrutinize the ultrastructure of cells and tissues, but it is also gaining momentum as a means to derive structural information on membrane proteins. As an example, Dr. Carragher described the use of single particle EM to directly visualize the conformational spectra of two homologous ATP-binding cassette (ABC) exporters. Single particle EM determines structure from multiple images of individual particles and uses methods like multivariate statistical analysis to separate heterogeneous particles into homogeneous classes. “ABC transporters constitute a large family of membrane proteins that use the energy of ATP hydrolysis to translocate (either export or import) substances such as nutrients, lipids, and ions across the lipid bilayers,” said Dr. Carragher. “They are medically important because they also transport drugs and contribute to antibiotic or antifungal resistance. As improvements continue to be made in the technology, resolution is nearing the 3 to 5 angstrom range, at least for some proteins and protein complexes. “EM is becoming competitive with X-ray diffraction for solving some protein structures. It is not likely to replace other techniques, but rather will be complementary to them,” she added. The outer membranes of gram negative bacteria, such as Pseudomonas and E. coli, consist of multiple proteins and densely packed lipopolysaccharides (LPS or endotoxin). This structure provides a formidable barrier to antibiotics, most of which are targeted to intracellular processes. “Understanding outer membrane structure and how molecules are recognized and transported across the bacterial membrane are critical to creating more effective antibiotics,” noted Lukas K. Tamm, Ph.D., professor molecular physiology and biological physics, University of Virginia. The Tamm laboratory studies the dynamics of membrane proteins especially via solution NMR spectroscopy. His laboratory provided the first structure of the outer membrane ion channel of E. coli, OmpA. The group also studies OmpG, an outer membrane protein whose single polypeptide chain forms a membrane nanopore. Dr. Tamm also studies the outer membrane protein H (OprH) from Pseudomonas aeruginosa, a multidrug resistant pathogen that is the most common cause of pneumonia and mortality in cystic fibrosis patients. It is the major cause of hospital-acquired infections. Dr. Tamm explained that there are many challenges remaining before antibiotic resistance can be overcome. Membrane proteins, such as receptors, ion channels, and transporters, comprise nearly 30% of all proteins in eukaryotic cells. They also constitute more than 50% of all drug targets. Yet, membrane proteins continue to present considerable challenges to the field of structural biology. Their surface is relatively hydrophobic, usually requiring potentially harmful detergent solubilization. Conformational flexibility and instability also may create roadblocks for the expression and purification required for structural analysis. The recent Argonne National Laboratory Conference on Membrane Protein Structures highlighted advances in the field such as use of smaller and more intense beams for X-ray micro-crystallography, novel protein engineering of fusion proteins for structure determination, nanodiscs that mimic native cell environments, visualization strategies employing single particle electron microscopy, and bacterial nanopore studies that may help surmount antibiotic resistance. 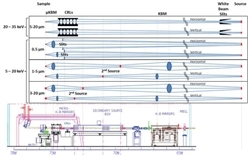 Schematic view of the planned upgrade of the GM/CA beamline 23-ID-D at the Advanced Photon Source (APS) at Argonne National Laboratory. Top panel: cartoon of the X-ray optics to focus the beam. Bottom panel: elevation view of the endstation focusing optics, sample goniometry, and detector. The beam line upgrade will reduce the minimum beam size from 5 µm to 1 µm in the near future. The proposed APS-MBA upgrade will allow the beam to be focused to <500 nm with a 100-fold increase in intensity. The small, high intensity X-ray beam will enable structure determination for some of the most challenging problems in structural biology. Many physiological processes are controlled and regulated by conformational changes in GPCRs and other integral membrane proteins. “We are studying at the atomic level how allosteric changes in such proteins regulate cell signaling,” explained Daniel M. Rosenbaum, Ph.D., assistant professor, biophysics, biochemistry, University of Texas Southwestern Medical Center.X-ray crystallography has been a workhorse technology for structural biologists for many years. Scientists generate a minute crystal by carefully optimizing conditions, shoot a high-powered X-ray beam at it, measure the angle and intensity of the diffracted beams, and derive a complete or partial structure by analyzing the results with sophisticated analytical programs. “Membrane proteins are notoriously difficult to crystallize, and often yield very small, weakly diffracting, radiation-sensitive crystals that are intractable to large-beam crystallography. However, high-resolution structures can be obtained by using a micro-beam,” noted Robert F. Fischetti, Ph.D., associate division director and group leader, X-ray Science Division, Argonne National Laboratory. Dr. Fischetti said the Advanced Photon Source (APS), a DOE user facility at Argonne, leads the field in deriving membrane protein structures. According to Dr. Fischetti, a number of key improvements and innovative approaches are needed. Dr. Fischetti said the field is also seeing the emergence of breakthrough techniques, including novel sample delivery systems such as the acoustic drop and microfluidic technologies. Further, throughput is advancing. One of the most exciting changes at APS and throughout the scientific community is the development of a new storage ring magnet lattice design, the multibend achromat (MBA). The technology promises a revolutionary increase in brightness that could reach two to three orders of magnitude beyond the current capability. In particular, Dr. Rosenbaum and his laboratory use protein engineering, X-ray crystallography, and NMR spectroscopy to study the structure and dynamics of molecules involved in hormone signaling and lipid homeostasis. Another example of using fusion proteins to overcome membrane protein crystallization limitations is that of the human orexin receptor, OX2R. The orexin system modulates behaviors in mammals such as sleep, arousal, and feeding. Dysfunctions can lead to narcolepsy and cataplexy. The FDA recently approved the first-in-class drug, suvorexant, which became available in early 2015. 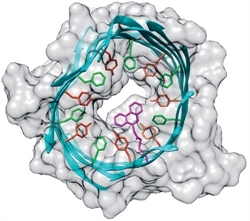 Dr. Rosenbaum and colleagues used lipid-mediated crystallization and protein engineering with a novel fusion chimera to solve the structure of the OX2R, bound to suvorexant at 2.5 angstom resolution. These studies have an overarching significance as well. “Looking at the bigger picture, these methods may lead to the design of new classes of small molecules that modulate key signaling pathways by controlling protein conformational changes within cellular membranes,” Dr. Rosenbaum concluded. Although membrane proteins can be purified following cell lysis and detergent solubilization or after expression in heterologous systems, their true structure and function can be significantly compromised or lost entirely in the process. Ideally one would like membrane proteins to remain in a solubilized state for easier purification, functional assays, and structure determination. However, the native membrane environment is often necessary for full functionality. Detergents pose many technical obstacles including being hazardous for protein stability and interfering in many assay techniques. Enter Nanodisc technology, a new approach for providing accessibility to the world of membrane proteins. “We’ve always had a dream of engineering a process that would not only incorporate any membrane protein into a soluble bilayer structure, but also one that would employ a self-assembly process that would be applicable to all individual membrane proteins regardless of their structure and topology,” explained Stephen G. Sligar, Ph.D., director of the School of Molecular and Cellular Biology, University of Illinois, Urbana Champaign. Dr. Sligar and colleagues even demonstrated how to utilize the new technology for high throughput screening (HTS) assays. “We wanted to identify antagonists that would interfere with the binding of membrane proteins to Alzheimer’s-associated amyloid β oligomers (AβOs), which are the neurotoxic ligands that instigate Alzheimer’s dementia. In collaboration with Professor William Klein and co-workers at Northwestern University, we created a solubilized membrane protein library (SMPL). This consisted of a complete set of membrane proteomes derived from biological tissue containing a heterogeneous mixture of individual proteins. The results need to be confirmed in animal studies, Dr. Sligar noted. Overall, he is enthusiastic about the Nanodisc platform for uses that range from determination of structure/function to HTS applications. When drug developers use different cell lines for manufacturing and preclinical research, they risk generating inconsistent results, proteins with various structures and functions. Then, confounded by variability, drug developers may lavish attention on irrelevant candidates and overlook promising candidates. To avoid misleading themselves, drug developers must find ways to avoid or account for protein variants, which include post-translational modifications, particularly alternative glycosylations. Such variants occur all too frequently among different host cell lines, an extensive body of literature documents. “Variability is most evident when comparisons are made between mammalian and nonmammalian cells,” says James Brady, Ph.D., vice president of technical applications and customer support at MaxCyte. “But depending on the protein that is being produced, even different mammalian cell lines, such as HEK and CHO, will exhibit substantial differences in post-translational modifications.” Differences can lead to altered protein stability, activity, or in vivo half-life. It is often unclear during the early drug discovery process which recombinant proteins will be affected by changing the host cell. However, misleading early-stage data are associated with significant costs and extended timelines. It therefore makes sense to adopt a single host cell for all stages of the development pipeline. That is the rationale behind MaxCyte’s flow electroporation transfection platform. Chemical transfection based on lipids or polymers are the most common alternatives to electroporation for large-scale transient transfection. However, reagent costs, lot-to-lot reagent variability, scale-up difficulties, and low transfection efficiency with certain cell types often are significant challenges of chemical transfection, particularly in biomanufacturing-relevant cells such as CHO. Unlike stable transfection, transient gene expression does not involve integration of the transgene into the host chromosome. Therefore, influences of the integration site on protein expression levels or other protein attributes are not evident. Rather the host cell’s genetic background, media/feed formulation, and culture conditions are the most significant factors influencing product quality, regardless of whether the protein is produced by stable or transient expression. While high-end titers for stably transfected cells are now advancing into the low double-digit grams per liter, average titers are still in the lower single digits. Thus, the titers of 2–3 g/L that have recently been reported for transient expression via flow electroporation in nonengineered CHO cells are beginning to rival those of stable cell lines. Analytical methods are crucial for quantifying not only protein expression but also quality. A group at Fujifilm Diosynth Biotechnologies led by Greg Adams, Ph.D., the company’s director of analytical development, is promoting analytical techniques applicable throughout a molecule’s life cycle. A scientist at Fujifilm Diosynth Biotechnologies operating an ambr250 mini-bioreactor system from Sartorius Stedim Biotech business unit TAP Biosystems. Note that all the aforementioned techniques are standard analysis methods. The novelty is the context in which Fujifilm Diosynth uses them. Another distinction is the company’s high-throughput approach. The company uses liquid-handling workstations with pre-loaded tips for culture purification over protein A. The 30–60-minute preparation provides purified, active, concentrated antibody that may be analyzed in a number of ways. “We are able to analyze multiple ambr™ minireactor or 2 L bioreactor samples in hours versus days,” asserts Dr. Adams. When it is applied to cell-line development, the rapid analysis philosophy holds that the same methods should be used from early development through GMP manufacturing. In practice, this is easier with antibodies because molecules of this class lend themselves to affinity purification and rapid method optimization through design of experiment (DOE), potentially beginning with transfectant pool material. The next challenge is to transfer this methodology to products expressed in microbial fermentation, which Dr. Adams refers to as the “next generation” of this approach to analytics. Escherichia coli became the workhorse of recombinant protein expression because of its simple genetics, ease of culturing, scalability, rapid expression, and prodigious productivity. Negatives include a lack of eukaryotic post-translational machinery, codon usage bias, and difficulty with high-molecular-weight proteins. Pros and cons must be weighed in terms of the target protein’s intended use. Quality and purity requirements for research-only proteins vary significantly, and may be worlds apart from therapeutic proteins. “The end application dictates to a large degree the choice of expression host, purity requirements, how you design the construct, and which tags to use,” says Keshav Vasanthavada, marketing specialist at GenScript. A disadvantage in E. coli on par with low expression is insoluble expression, which results in aggregates (inclusion bodies). Researchers can deal with this phenomenon at the process level or molecular level. But before they embark on an improvement project, they should, Vasanthavada advises, check the literature to see if other researchers have produced the target protein in adequate yield and at acceptable quality. If so, it would be worthwhile to look at the other researchers’ methods and see if they can be reproduced. Process-level strategies, which do not require target reengineering, include changing expression conditions, in vitro protein refolding, switching E. coli strains, adjusting media and buffers, or incorporating chaperone co-expression. Molecular-level approaches involve eliminating undesirable elements through truncations or mutations. Researchers at the pharmaceutical company Merck have identified a new bacteria-killing compound with an unusual target—an RNA regulatory structure called a riboswitch. The team used its drug, described in Nature today (September 30), to successfully reduce an experimental bacterial infection in mice, suggesting that the molecule could lead to the creation of a new antibiotic. Moreover, the results indicate that riboswitches—and other RNA elements—might be hitherto unappreciated targets for antibiotics and other drugs. The team’s research began with the idea of finding a compound that blocks the bacterial riboflavin synthesis pathway. Riboflavin is an essential nutrient for humans and bacteria alike, but while humans must consume it as part of their diet, bacteria can either scavenge riboflavin from the environment or, if supplies are lacking, make their own. “We targeted the riboflavin pathway because it is specific to bacteria so you have a built in safety margin,” said John Howe of the Merck research laboratories in Kenilworth, New Jersey, who led the research. The team found one molecule that fit the criteria and called it ribocil. To investigate the molecule’s mechanism of action, they applied it to cultures of E. coli cells until colonies emerged that were resistant to its effect. The researchers then sequenced the whole genomes of each of the resistant bacterial strains to find which genes were mutated. The majority of drugs target proteins, explained Howe, “so we assumed that the mutations would be in one of the enzymes in the riboflavin synthesis pathway.” But as it turned out, while all of the 19 resistant strains did have mutations in a gene called RibB (which produces one of the riboflavin synthesis enzymes), the mutations did not affect the protein itself. They altered a non-coding part of the messenger RNA transcript: the riboswitch. Riboswitches are regulatory elements at the beginning of messenger RNA transcripts. They bind molecules—normally metabolites—that typically suppress the transcript’s expression. “So instead of regulating the enzyme itself, [ribocil] is regulating the production of the enzyme,” Howe said. Indeed, through reporter assays and crystallization experiments, the team confirmed that ribocil directly interacted with the RibB riboswitch, preventing expression of the protein. The team went on to tweak ribocil’s chemical structure, improving its killing efficiency and prolonging its effectiveness inside the body. The researchers then showed that this enhanced version of ribocil could effectively reduce bacterial burden in mice infected with a weakened E. coli strain; the bacteria are unable to efficiently expel drugs. Weakened E. coli were used because wild-type E. coli are adept at ejecting ribocil and other compounds before they can take effect. Finding a way to keep ribocil in the bacteria and making other improvements will be necessary before it can be used as an actual antibiotic, explained Howe. J.A. Howe et al., “Selective small-molecule inhibition of an RNA structural element,” Nature,doi: 10.1038/nature15542, 2015. Assay Drug Dev Technol. 2015 Sep;13(7):402-14. doi: 10.1089/adt.2015.655. High-Content Assays for Characterizing the Viability and Morphology of 3D Cancer Spheroid Cultures. Sirenko O1, Mitlo T1, Hesley J1, Luke S1, Owens W1, Cromwell EF2. There is an increasing interest in using three-dimensional (3D) spheroids for modeling cancer and tissue biology to accelerate translation research. Development of higher throughput assays to quantify phenotypic changes in spheroids is an active area of investigation. The goal of this study was to develop higher throughput high-content imaging and analysis methods to characterize phenotypic changes in human cancer spheroids in response to compound treatment. We optimized spheroid cell culture protocols using low adhesion U-bottom 96- and 384-well plates for three common cancer cell lines and improved the workflow with a one-step staining procedure that reduces assay time and minimizes variability. We streamlined imaging acquisition by using a maximum projection algorithm that combines cellular information from multiple slices through a 3D object into a single image, enabling efficient comparison of different spheroid phenotypes. A custom image analysis method was implemented to provide multiparametric characterization of single-cell and spheroid phenotypes. We report a number of readouts, including quantification of marker-specific cell numbers, measurement of cell viability and apoptosis, and characterization of spheroid size and shape. Assay performance was assessed using established anticancer cytostatic and cytotoxic drugs. We demonstrated concentration-response effects for different readouts and measured IC50 values, comparing 3D spheroid results to two-dimensional cell cultures. Finally, a library of 119 approved anticancer drugs was screened across a wide range of concentrations using HCT116 colon cancer spheroids. The proposed methods can increase performance and throughput of high-content assays for compound screening and evaluation of anticancer drugs with 3D cell models. The Center for Biomedical Imaging in Oncology (CBIO) at the Dana-Farber Cancer Institute in Boston is a centralized cancer imaging research enterprise that was established to enable translational cancer research and drug development through the integration of preclinical and clinical imaging, access to preclinical/clinical multidisciplinary and multimodality imaging expertise, as well as drug/imaging probe development. The molecular processes behind cancer were once seen as through a glass, darkly. But now they are being reflected more clearly, thanks to advances in probe synthesis, preclinical cancer modeling, and multimodal imaging. These advances have positioned imaging as a key tool for basic research, as well as for translational and clinical applications. To bring cancer visualization trends to light, CHI recently held a conference, Translational Imaging in Cancer Drug Development, as part of the World Preclinical Congress in Boston. This conference attracted leading imaging experts from industry and academia, including scientists and clinicians who use their expertise to accelerate cancer research. Many of the experts described how, with a little creativity, imaging modalities can be used to translate scientific discoveries into clinical applications. Several examples of creative imaging from the conference are discussed in this article. To start, this article will highlight one investigator’s new take on a familiar technique, positron emission tomography (PET). LFIC is fully equipped to meet the creative demands of translational molecular imaging. It is an integral part of the Center for Biomedical Imaging in Oncology (CBIO), which also includes a clinical imaging research group. In addition to LFIC and CBIO, the Dana Farber Cancer Institute includes medicinal chemistry capabilities and expertise, and has recently established the Molecular Cancer Imaging Facility housing the only PET cyclotron in the state dedicated entirely to the development of novel radiotracers for cancer research. “A unique attribute of our Cancer Center is the fully developed Mouse Hospital, mirroring every aspect of human cancer diagnostics and care,” noted Dr. Nguyen. The center uses genetically engineered mouse models that can be matched to the specific genotype of a given individual patient. Alternatively, the Center can rapidly generate xenograft mice and orthotopic murine tumor models using human tumor cells obtained from biopsies. In either case, the resulting mouse model is a faithful genetic mirror of the patient’s tumor. Dr. Nguyen’s team deploys PET imaging to inform patient treatment in co-clinical trials. Once a patient’s genotype is identified, an appropriate mouse model is selected, sometimes in combination with additional mutations. The mouse is treated with a desired therapy, and functional and molecular outcomes can be rapidly detected by PET imaging. Mouse-derived data can then inform the design of the clinical trial and be fully integrated with clinical data. In a seminal study, lung tumors carrying several combinations of cancer mutations were simultaneously tested in genetically engineered mouse models and in patients with lung cancer enrolled in a clinical trial to assess response to a combination therapy with a novel drug compared to standard of care. The radiolabeled glucose analog was used to visualize the lung tumors by PET in both mice and patients. Remarkably, within 24 hours after therapy initiation, preclinical PET imaging demonstrated treatment response to the combined regimen for some but not all the mutations. This information helped identify the resistant mutation in patients being considered for enrollment in the clinical trial and allowed enrichment of the patient population by selecting patients carrying those mutations that had showed metabolic response in the preclinical setting.